employees…unless they leave your package with someone else across town. I've been using these services frequently for the past 10 years to buy and sell items. The service was reasonable when I first started, but now between the cost, the delays, and changes with shipments it has become very frustrating to work with them. A week ago, I was waiting for a package from UPS that tracked the item all the way to my house. I must say when I got home and found nothing on my porch I was very disappointed. The dispute process for this item through UPS was actually pretty simple and straight forward. Later that night, a person knocked on my door and said that my package was delivered to their house. The box was ripped open, but the items were still in the box. Tell me how the UPS delivery person dropped my package off across town? My street name is the only one in the town and it also says my house number plain as day on the front of my house. I know mistakes happen, but this happens way too frequently. So today, I am waiting for a very important package that is being shipped with UPS. I was alerted that there was a delay with the truck and now I must wait another day. I like the fact that I get updates on these packages. However, think about this…what if I was running a true business? This happens too frequently to consider it a reliable business partner. I do feel that USPS does a better job on a more consistent basis by meeting the needs of us buyers and sellers. Bottom line, who holds these companies accountable for true reliable service? Is it the competition between companies that brings that demand? Times have changed and USPS can no longer profit from people mailing letters, selling stamps, etc….so cost goes up because of that. I know a lot of people use the printable shipping method and leave the items to be picked up and shipped. I believe doing that increases my shipping cost on a regular basis. What seems to work best for me is using my own boxes, packing materials, and asking for the best shipping options. I never use UPS to ship for so many reasons but mainly for the cost and (lousy) service. So, do you agree or disagree with the service we are getting from these two companies? Are you happy with how quickly you are getting your items? Or how quickly they reach your buyers? I would like to hear everyone's thoughts on this? What's up!!!! It's time to take a look at the NECA Robocop 3 Jetpack figure! First, I have to say this is probably my favorite Robocop figure to date. Everything is well made and detailed. It comes with a lot of cool stuff! Robocop's packaging is similar to the other NECA versions of him. It shows off the great looking figure, weapons, and jetpack that he comes with. If you see him in a store he's going to catch your eye! The figure itself has a great look to it that shines with some tints of vintage-looking color. He still has his side holster with black pistol that pops out the same way as previous figures. He is very sturdy and his right arm is detachable for one of his sick guns. He is a little hard to stand with his jetpack on because of the weight, but it's easy to get him to stand once you figure it out. Robocop comes with the awesome Cobra assault cannon and machine gun attachment for his arm along with his jetpack. They are all great weapons and it's worth buying the figure just for the weapons alone. He is my favorite Robocop figure NECA has made! It has great weapons and a sturdy figure with a nice finshed look to him. I took some pics of Robocop and ED-209 battling it out to give you an idea of what your display could look like! Hey everyone. I hope all is well in the toy collecting world! We wanted to talk about the 1980's Super Powers line and what figures we all had as kids. Also, we wanted to compare the newer line that pays homage to these wonderful, classic figures! I think everyone, including me, had a Superman figure when we were growing up and most likely a Batman figure as well. I had them both along with Aquaman, Firestorm, Green Lantern, Dr Fate, Darkseid, Wonder Woman and a few others. Starting to bring back those wonderful 80's memories yet? I have now collected 26 figures from this line. There are some others I just haven't bought yet because I am waiting for the right price. Below is a picture from my vintage collection of the classic figures from the DC Comics line! Who was your favorite from this line when you were growing up? I have also started to collect the DC Universe figures from the past few years because I think they do the old figures justice! My most recent figure was the Darkseid Build a Figure who is a beast and towers over all of them. I believe the new line is very close to the original figures just with better detail. So based off your experience and the pictures which line would you rather own? Would you prefer the classic smaller figures or the larger, more detailed figures recently made? What's up everyone? How's the collecting going? This Friday I received the new Sideshow Batman directly from Sideshow. Up until now, I have only collected the Sideshow GI Joe figures, but I am very happy to have branched out to Batman...and even more to come! Batman comes with some really cool box art that, in my opinion, perfectly captures the true look of Batman. If you love the classic Batman then this is the figure for you. The classic symbol and the look of his cape look amazing! The Sideshow exclusive comes with a battle damaged face that has some excellent details on it. The figure itself is massive. He is built like he is indestructible! He comes with a nice set of weapons including a Grapple and Bat Blades. Some people are not too happy the yellow oval is not around his bat symbol, but I think it looks fine. Of course, everyone has their own preference for how Batman should look. His cape is the craziest part about him. It's so long and wide...you can really get the look of a bat coming down at you with the cape spread out. The stand he comes with allows for multiple levels of display depending on how you want him to look. I am planning on putting the Play Arts Deathstroke next to him on the shelf! He displays very well in multiple poses on his stand. I like the look of the ring and his cape hanging just over his arms. I also like all three of the faces he came with so I will probably swap those on and off a lot. As I was saying before, the actual body of this figure is huge and is extremely detailed. If you are a Batman lover, or even a comic book fan you need to get this figure. 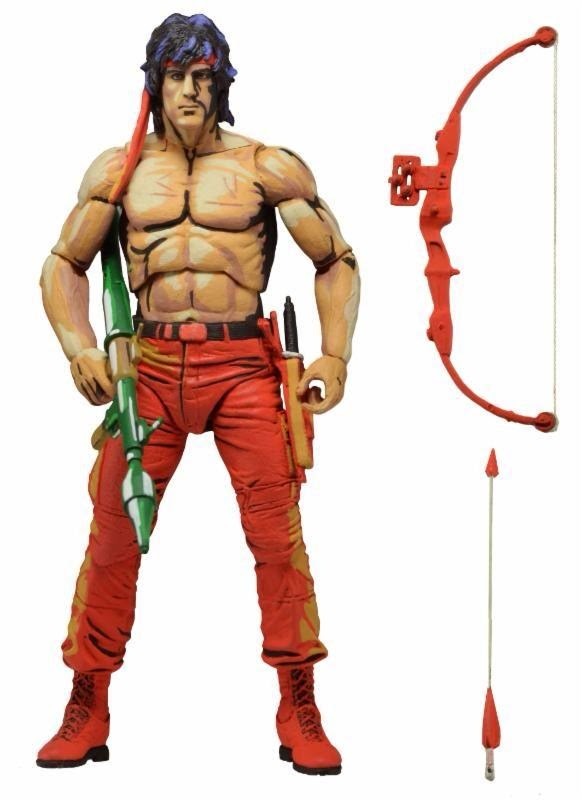 Last night NECA Toys previewed an upcoming NES Rambo figure on their Twitter page. Steve and I got to see this bad boy in person a few weeks back when we toured NECA studios. Of course, Randy swore us to secrecy since it was not announced yet. Haha We have been dying for them to announce this figure so that we can talk to people about it. The picture looks excellent, but just wait until you get this in your hands. The paint is killer on it. 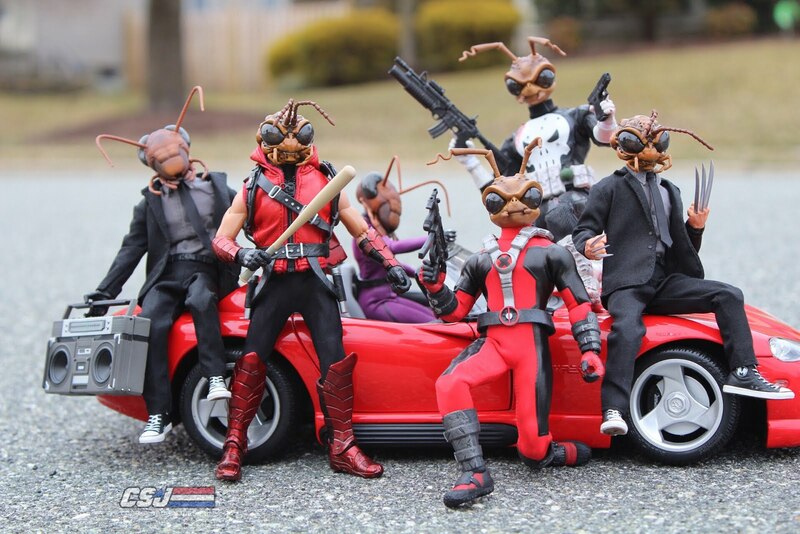 NECA just keeps raising the bar higher and higher with each new figure that they release. And keep in mind, the NES Rambo is just the tip of the iceberg when it comes to new figures that they are working on. They have so much more awesomeness in store and their new figures will blow your minds. 2015 is going to be a great year for NECA Toys so start saving your money now!